With each site hosted on Themeco Hosting you can get free backups by BlogVault. We have built an automated system which recognizes sites hosted with us and as long as you are backing up sites hosted with Themeco Hosting your account will remain active and free. To get started log into your hosting dashboard and click on the Setup your Backups! link. You will be directed to the BlogVault create an account page which requires your email, password and one of your Themeco Hosting site urls. Once you've entered all credentials the next step is to install the plugin BlogVault plugin on your WordPress installation so the backups can be synced in real time. There are two options available. 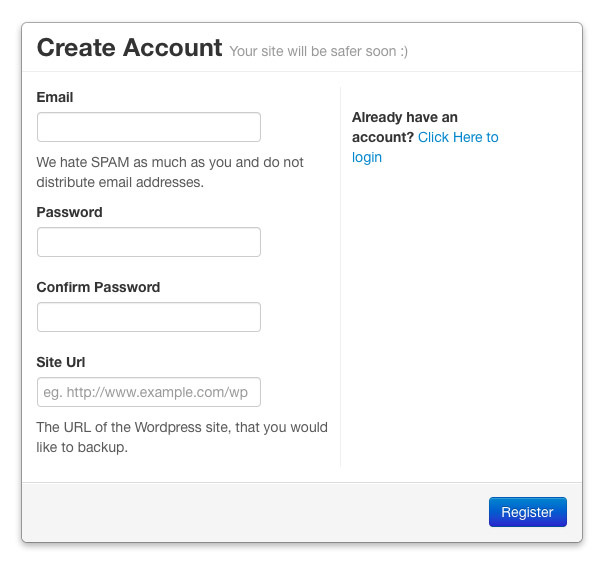 Auto installation which requires the WordPress login credentials and the manual installation. As soon as the plugin is installed the syncing will start. BlogVault will remove unnecessary files like logs from your backups so your backed up files stay as slim as possible. Once syncing is done you have a variety of options that you can utilize when needed. This option initiates a manual backup. You can do that if you are about to do a major change and would like to have a backup done before. History gives you a good overview about all the actions and backups performed by you and BlogVault. You can keep backups on your local disk by downloading it. This is not required but a nice addition if you want to be extra secure or need the backup for your local environment. Auto-Restore lets you restore from your most recent backup. This option lets you migrate the backup to another web server for example your staging environment. Secure Site gives you a toolset of functions that can increase the security of your site. Due to the fact that you are already using Themeco Hosting they are not really required but can't hurt. This feature enables you to upload your backup directly to your Dropbox account. If you want to pause backups this function will suit your needs. These options won't be required as you are using Themeco Hosting which works out of the box with BlogVault.